India is noted for being the seventh largest country of the world and covers an area of 3,287,590 km2. This South East Asian country has been the major tourist hub for those who want to witness something unique and different than what they are used to see. Besides its architectural wealth, India boasts of being gifted with some exceptionally beautiful natural attractions that are incomparable. As the country is surrounded by Bay of Bengal and Indian Ocean and Arabian Sea in its three sides, it leads to the formation of some wonderful beaches in India. The Top Beaches in India are scattered in different parts of the country from west to east and south. States like, Goa, Maharashtra and the union territory of Andaman and Nicobar is gifted with some fascinating beaches to the tourists. Those who are not aware of the vast treasure of beaches in India will know that some of the popular beaches of India like, Dona Paula Beach, Anjuna Beach, Colva Beach, etc. This Top Beaches in India is known for being the ideal hub of the tourists who are die hard fans of beaches. As you visit these beaches you will explore the untainted beauty of the place. The white sands, clear blue water and host of beach activities tempt the tourists to choose these destinations. The beaches are the main ingredients for the development of India Tourism and our country is trying to maintain the beauty of these beautiful beaches. Walking down the clean and quiet beaches of Goa and tasting the delectable coastal foods is surely a memorable experience. The idyllic location of the beaches and scenic beauty of these beaches make them irresistible. Among the Top Beaches in India, the name of Gopalpur Beach and Puri Beach of Orissa must be mentioned. Tourists from all corners of the world come to experience the blissful ambiance and natural gift of these beaches. These secluded and tranquil beaches are the ideal places to go if you are on an incentive tour. 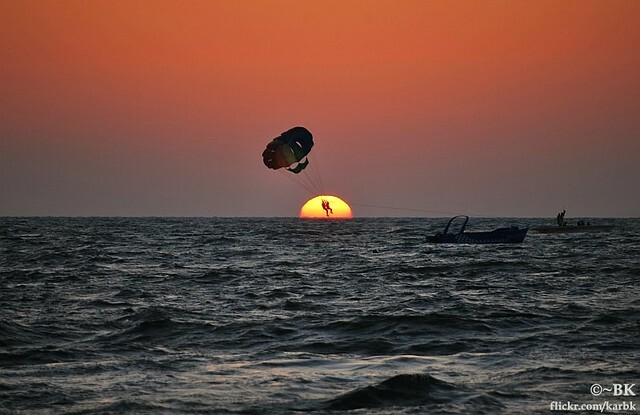 Some of the beach activities like surfing and sailing are considered among the best activities. The tourists will have the privilege of spending some quality time in these beaches. As you come down to southern part of India and visit Kerala, Kovalam Beach will be ideal place to relax and refurbish our senses. 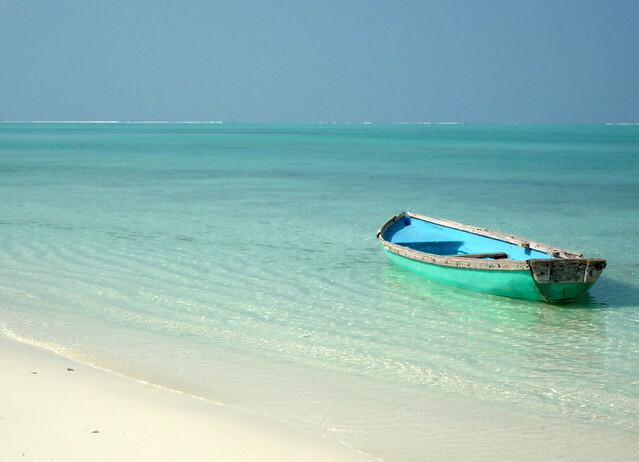 The beaches in Lakshadweep like Kavaratti Beach, Kalpeni Beach, etc are counted as the Top Beaches in India. 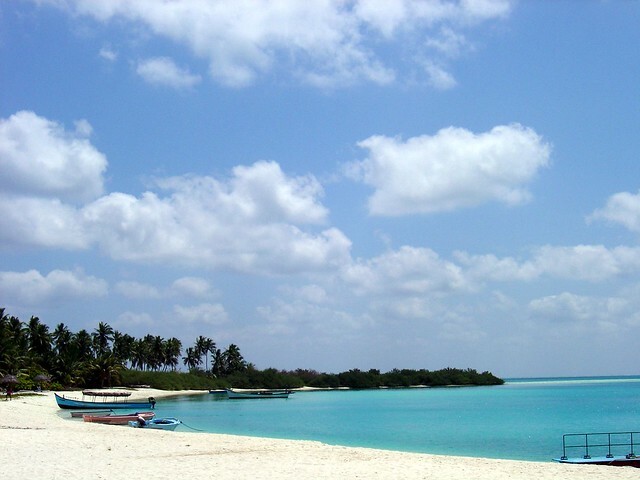 If you want to see some spectacular lagoons and indulge in water sports, swimming and basking on warm sandy beaches, then come to Lakshadweep. Apart from these Popular Beaches in India, the beaches of this exotic place will allow you to see the scenic beauty and the coral islands. Spending some valuable time with your partner in these beaches and opting for snorkeling, boat rides parties on board and deep-sea diving, will really offer you a splendid treat. The Beach Tour Packages to the Top Beaches in India will let you allow the privilege of witnessing some exotic locales and experiencing an activity-filled holiday. When you've had enough of lazing in the sun and are ready for some action and fun, you can participate in any of the numerous beach activities offered on the beautiful Indian beaches! For instance, you could indulge in any of the exciting water sports such as surfing or parasailing, or go swimming in the clear blue sea, or even try your hand at building a sand castle or playing a game of beach volleyball! As a commercially valued beach in Kerala, life never stops here in Kovalam. The activities here run deep into the night and the beach is highly acclaimed for water sports. It is situated 16 km from the capital city of Thiruvananthapuram and has been an ideal one for sun bathing and massaging. You can also view a beautiful bay of calm waters created by a huge rock promontory. 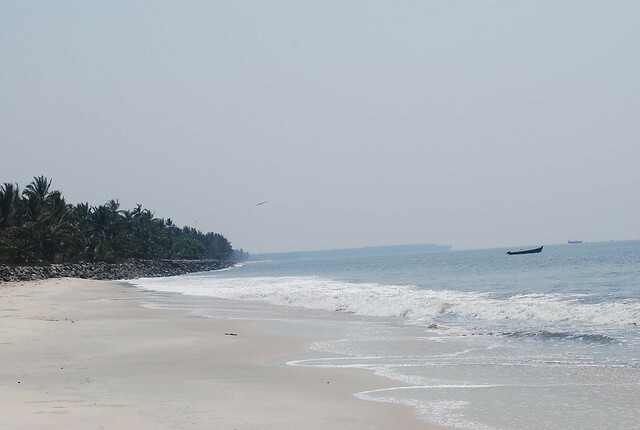 Cherai Beach lies at a distance of 45 km from the Ernakulam city and forms the border of the popular Vypeen Island. It is highly popular amongst tourists because of Dolphins. Dolphins, of course exude an infinite beauty and perhaps even make the hearts of visitors leap out in delight. Swimming is also quiet a good option in the Cherai beach.Beach is generally reckoned as one of the must visit spots in southern parts of India. It is also known by the name of “Princess of Arabian Sea” due to its proximity to the city of Cochin, which in turn, is called as the “Queen of Arabian Sea.” It has all the components which would make a beach a world class beach. The coconut palms, the paddy fields, the backwaters – and everything else makes it one beach which you cannot afford to miss. Varkala beach, also known as Papanasham beach, is found between Alleppey and Kovalam. Being an epitome of picturesque beauty, it feeds the photographers with varieties of stills thereby satiating their desire of capturing exquisite things. It is said that one dip – if made in the waters of this beach removes the sins committed for a life time. 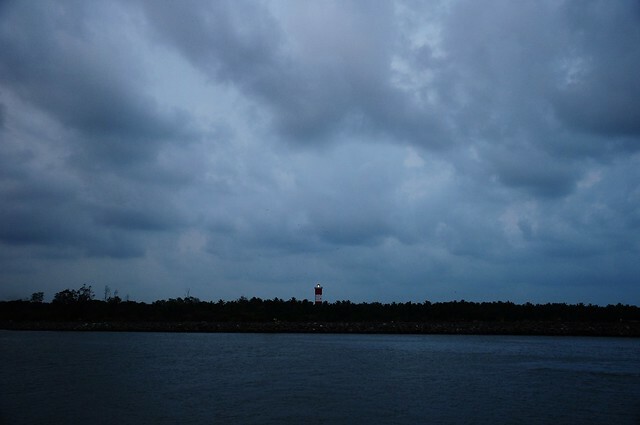 Located in the Kannur district, the Moppila Bay shot into limelight during the reigns of Kolathiri. However, the bay is presently recognized as a fishing harbour. For a bit of sightseeing, there are ruins of an old fort (St Angelo's) and a temple. Bekal is a very famous beach in Kerala.This beach is merely 14 km away from the city of Kasodgarh in the district by the same name in the northernmost part of Kerala. The beach boasts of a 3 century old fort in its background which lends its a historic significance. The panoramic beauty here is breathtaking. Adjacent to it is a giant keyhole shaped fort which is supposed to be the biggest in Kerala which adds to its popularity. It is a very cleanly maintained beach and therefore it entices more people to visit. The highlights of the beach are the splashy waves and remarkable views of the sunset. Almost all the people in India who are movie buffs might have seen this beach without knowing it’s name. There was a song shot in this place featuring the hero in a sober mood in Maniratnam’s “Bombay.” No prizes for guessing which song it was. Undeveloped and quiet Marari Beach is situated very close to Alleppey. It is not a very recognized beach and more often than not, it gets overlooked. Though not very popular as a beach, it is a perfect place for those who love to explore backwaters of Kerala. Marari got its name from a small and sleepy fisherman’s village called Mararikulam. Cochin or Kochi is a very popular tourist destination and the beauty of the place seems to coming from the numerous backwaters and scintillating beauty of the beaches found here. Fort Kochi Beach Kerala is one such fascinating beach located in Kochi and this place has been a huge crowd puller for its sheer beauty. Kappad beach is known for the visit of Portuguese explorer Vasco Da Gama who landed here on May 20 1498 in an endeavor to establish a sea route to India. To honor the day of historical significance, associated with this beach, a monument has also been erected, proving the presence of Portuguese explorer in this part of the world. Thanks to the deliberations of tourism ministry in cleaning the beach, it has now become one of the most visited places in Kerala. This one is in the Kozikode district of Kerala and also an erstwhile significant port city of the state. Right from the very beginning, Beypore has been renowned for its excellent construction of Urs, the Arabian trading vessel. These ships were in huge demand earlier and even today, shipbuilders, known as Khalasis, have big customer line up from Middle East as well as across Arabian Sea. On your visit to the Beypore beach, you can still find experienced Khalasis at their work (which surprisingly is completely manual). This beach is the pride of an island known by the same name. Spread in an area of five acres, this island is not a public property which means that permission has to be sought before you can actually step on the sands of this beach. The beautiful island with coconut palms and green bushes is located at a distance of 17 km from the Kannur town (in the district of same name) in the northern part of Kerala. 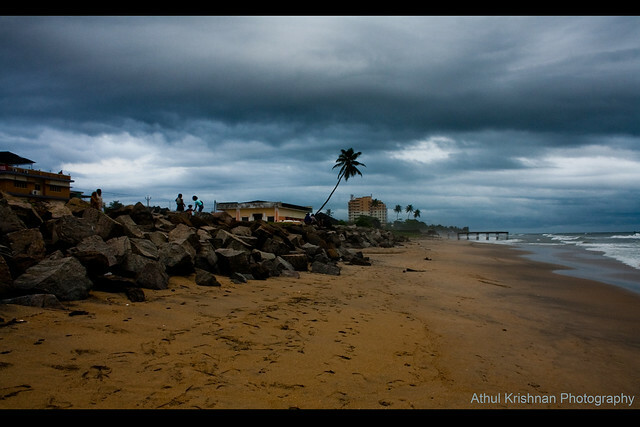 Alappuzha beach is one of the most popular spots in the district of Alappuzha. The pier, which extends into the sea here, is around 140 years old.With the Arabian Sea on the west and a vast network of lakes, lagoons and several freshwater rivers criss-crossing it, Alappuzha is a district of immense natural beauty. 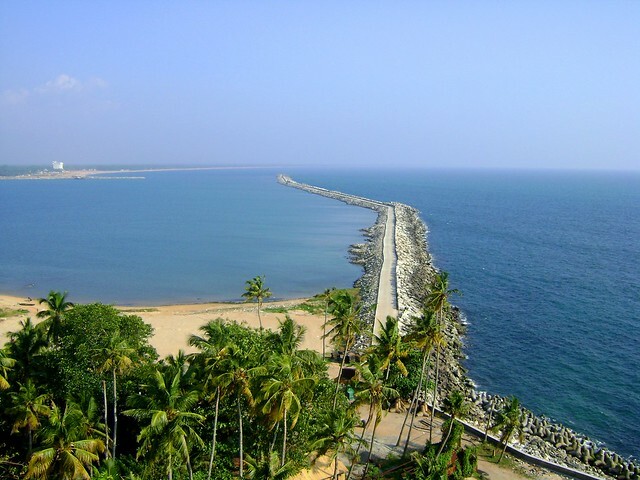 This beach is widely known for its length which is perhaps the largest in entire Kerala. 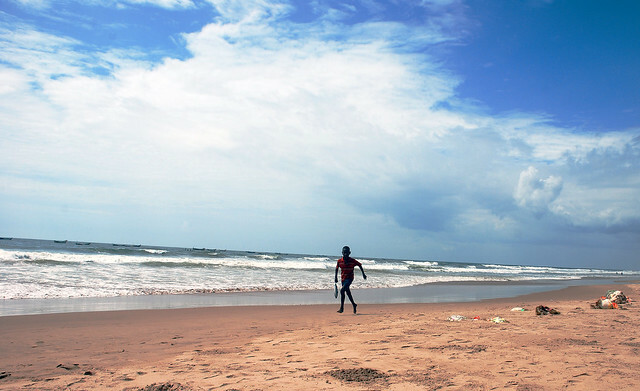 The beach which is located in the Kannur district is pleasantly clean and allows safe waters for swimming. The particular feature of this beach that sets it apart from the other beaches is that it is the only drive in beach in entire Kerala. Situated close to the Kannur town, the Payyambalam beach is counted amongst the best beaches of Kerala because of its serene beauty. Opportunities to relax and sunbathe is plenty. The beach has also a historical significance attached to it in the form of mortal remains of famous personalities like Swadeshabimani Ramakrishna Pillai, A.K. Gopalan, Pamban Madavan and K.G. Marar are buried here. This is beach is quiet favourite amongst the lovers of nature. 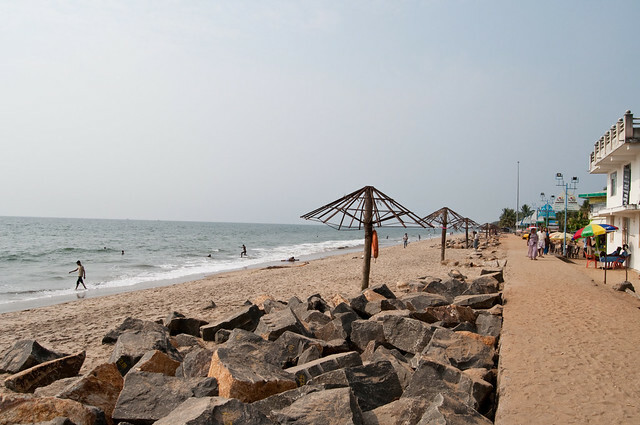 Pretty close to the Thiruvananthapuram Airport and Veli Tourist Village, this beach provides easy access for visitors. There is also a 35 m large sculptural image of a mermaid known as 'Matsya Kanyaka'. This beach and its little village has a historical significance to make them popular. There is a lighthouse that welcomes visitors desirous of paying a visit. The village also has the remnants of an old Portuguese fort. With fresh air flowing all around, the Thirumullavaram beach is just perfect to enjoy a walk early in the morning. The swaying coconut palm trees contribute to the tranquil beauty as you watch fishermen setting out to the sea in search of catch. Bathing is quiet a good option in this beach. Kappil beach is a pristine holiday spot along the Malabar shore line, located about 15 kilometres south of Kasaragod town.The beach has captivating beauty that attracts tourists who are looking for a serene location, to spend an evening, or even to settle for a few days of relaxing beach holidays. If you enter Goa from Karnataka, this is probably the first beach you will come across. Facing a blue bay between two headlands is Palolem. 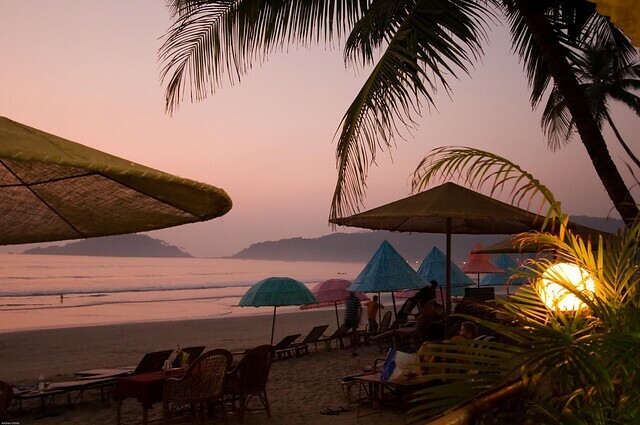 The crescent shaped Palolem Beach is located in the market town of Chaudi in South Goa. It is one of the most beautiful beaches in Goa. It is an ideal place to plan for holidays. This beach is an open invitation to swimmers as the depth of the sea increases only gradually and as the waves are not very threatening. Baga Beach, situated in North Goa, is a very busy tourist spot and is just 10 kilometres away from the capital of Goa, Panaji. Baga beach is an extension of Calangute beach. In fact, it is difficult to mark where one ends and another begins. A rocky wooded headland marks Baga beach. 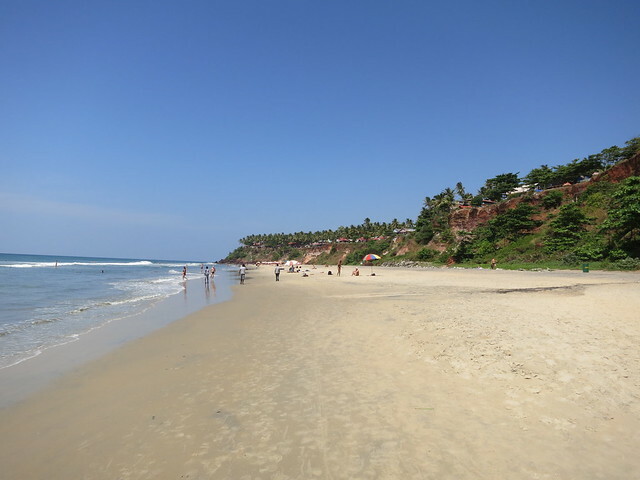 It is less congested in comparison to Calangute beach. Being one of the most happening beaches on the coast, you can find all sorts of entertainment here. This place is very famous for its night life. 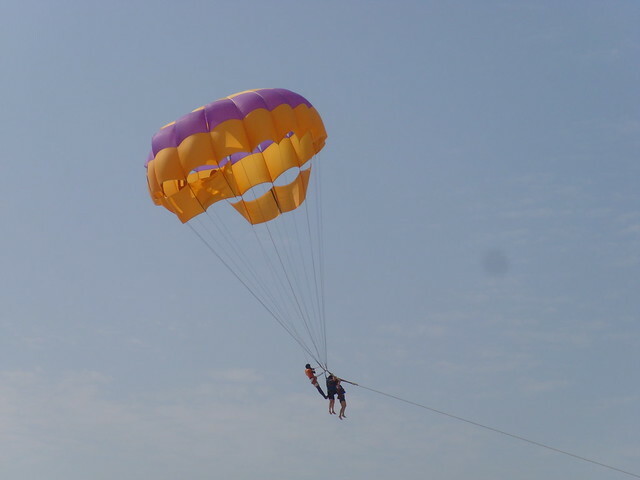 The beach also hosts varieties of water sports and many attractions like parasailing, windsurfing and kite surfing, to name a few. Nine miles from the Goan Capital Panaji. 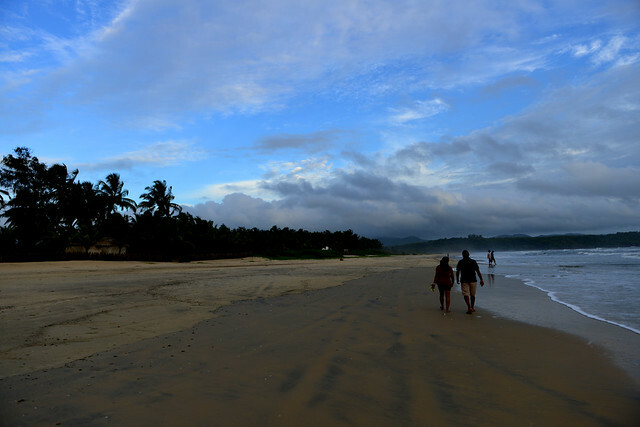 Hailed as the "Queen of the beaches", Calangute beach is the largest one in the northern region of Goa. The night life at the beach presents a live wire experience with many foreign holiday makers and locals dancing into the night to great upbeat music. It happens to be a perfect place for partying. Water sports like skiing, surfing and parasailing are also prominently played here. Fifteen kilometers from Panjim, the Goan capital, is Candolim beach in north Goa. 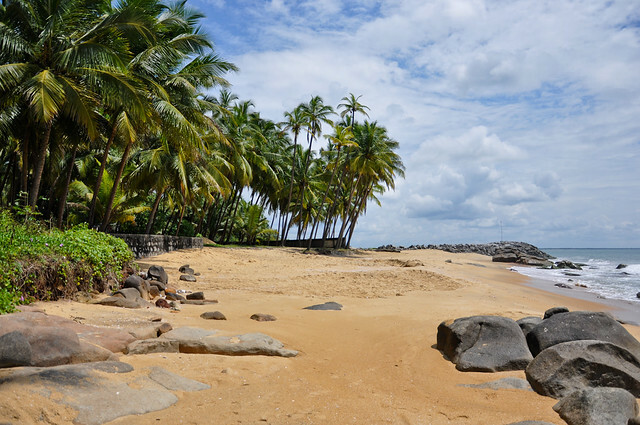 Beginning at Fort Aguada and merging with Calangute beach towards the end, it is one of the longest beaches in the state and is located in the Bardez taluka. The beach in itself is very calm and peaceful, at times tourists come here from Rajneesh Ashram in Pune to take a break. 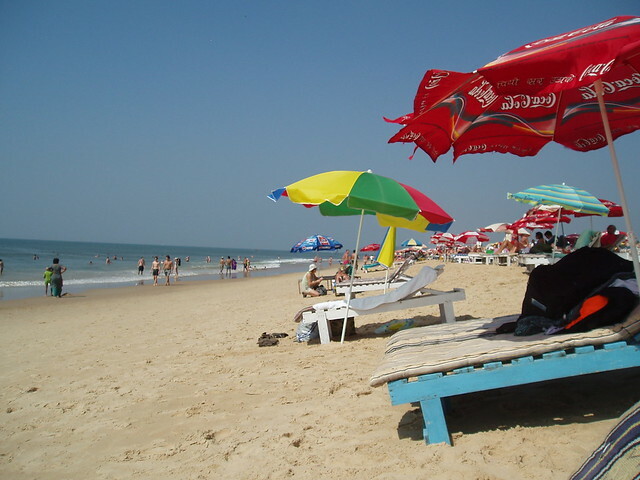 A preferred destination for beach goers – the Candolim beach – is located in the northern parts of Goa. Other than regular adventure sports, this beach also offers tremendous opportunities for those who love to do fishing activities. The peaceful ambiance which we can see here brings in people for practicing yoga and meditation. There are also arrangements made here to take travelers far into the sea to have an opportunity to capture spectacular sunsets on their cameras. Situated eight kilometers west of Mapusa, Anjuna beach is the most happening of all beaches, one rather say its the mother of all beaches in Goa. 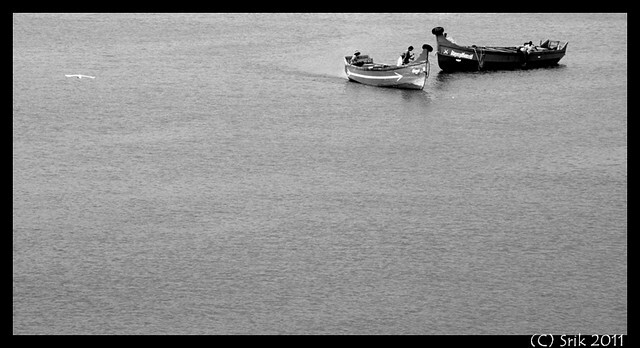 This freak capital of the world is on holiday round the year.The magic of Anjuna beach can't be put to words, only experienced, maybe in a hopping beach party under a moon lit sky.Thanks to the curlie’s at the end of the beach – where people meet to have some fun and enjoy music – the good times are not unusual for this place. It is found in the north of Baga and Calangute beaches and close to the south of Vagator beach. Twenty four kilometers from capital city, Panaji, this beach is the north most beach of Bardej Taluka. Perfect for a romantic holiday destination, a red laterite cliff looks down to soft white sand dotted with black lava rocks.Vagator is another renowned beach in the northern parts of Goa, noted for sunset viewing. Tourists throng to this place for it’s beauty. 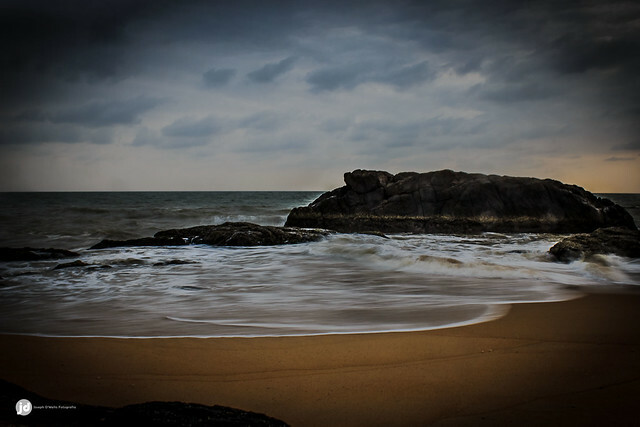 The beach of Vagator is classified into two – the right side of the sea, as you face it, is called as the Big Vagator and its left side is known by the name of Little Vagator . Pretty much a laid back beach it is as compared to other beaches in the state. Located in the southernmost Canacona Taluka of Goa, Agonda beach is most suited for sunbathing and relaxing. It is a relatively quite beach. Probably this serene atmosphere, aided by less number of visitors, is one of the reasons why it is proving to be an ideal nesting site for Ridley turtle. If you love partying, this is not the place which you should be looking for. Forty one kilometres away from Goan capital, Panaji and two kilometres away from the longest beach Colva is Benaulim beach. Legend has it that this is the place where an arrow shot by Lord Parshuram, sixth incarnation of Vishnu landed. The arrow shifted back the hills hence forming the Konkan. The place was hence named Banavli (ban means arrow) and later got corrupted to Benaulim by Portuguese. With romance is in the air, the beach is bustling with activity throughout the year. Just seven kilometers from the Goan capital, Panjim is Dona Paula, the most happening beach of the state. 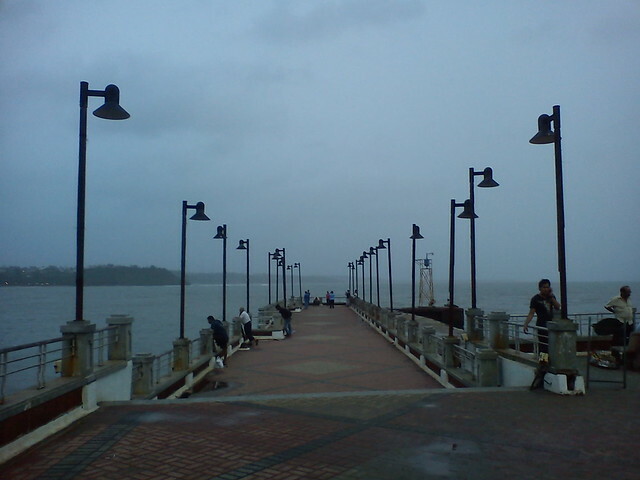 Dona Paula is nestled on the southern side of the rocky headland dividing Zuari and Mandovi estuaries. The greenery to the beach is lent by palm trees and casuarina groves and it presents an excellent view to the Mormugao harbour. The beach has the obvious advantage of being in proximity with the capital city. During festivals like Janmashtami and the feast of St. Lawrence, Dona Paula is immersed in the colours of festivity. Colva is forty kilometres from Panaji, the Goan capital and two kilometres from Benaulim.Till few years back, before the beach resorts had not made their foray on Colva beach, it was an easy escape for those seeking ultimate solitude. Thankfully, the development in the past few years has been pretty fast paced making Colva southern Goa's main tourist beach. Nevermind the activity, Colva still has miles of virgin territory laced with soft white sand for you to explore. Adjacent to Colva is its secret suburb, Sernbatim beach. Longest among all beaches in Goa, Colva stretches twenty kilometres along the Arabian sea, about six kilometres west of Margao. 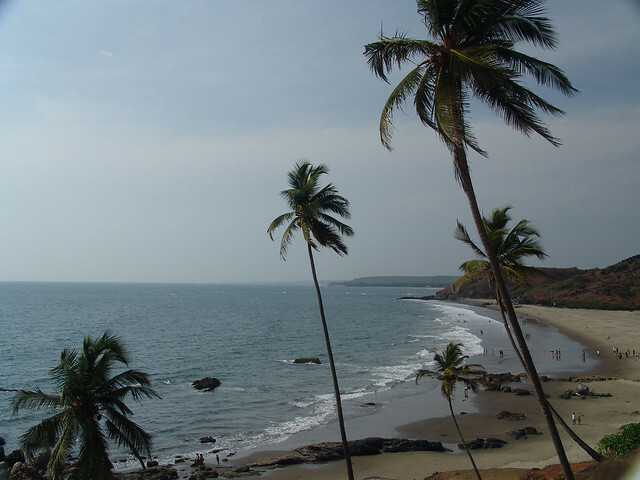 Lined with coconut palms throughout, Colva has Bogmalo in north and Cabo de Rama in south. In the pre colonial era, Colva had the honour of being the retreat zone of Margao's high society. While speaking of history of Colva, the name of Our lady of Mercy Church invariably comes up. More about the church in the later paragraphs. 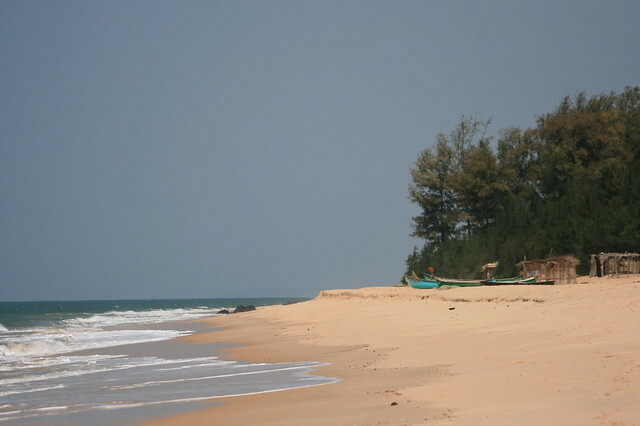 Arambol Beach is the North Goan Beach. It was the first beach in Pernem in 1980's to be invaded by tourists, who actually were hippies and had come here to get away from the fast commercialising beaches. There are shops selling sarongs and some beach shacks also. Other attraction of this Goa beach is Our lady of Mount Carmel Church. This Goa beach is very close to airport, you can see the flights literally landing and taking off from this beach. Covered with Western Ghats from three sides, the beach looks very different from other beaches in Goa. With golden sand, white waves and a green carpet from three sides, Bogmalo looks pretty beautiful. It is a perfect place for a quick stopover in case you have to take a morning or afternoon flight from Dabolim airport. Varca is the longest stretch of beach front in Salcete. It is also the loneliest of all. There are few beach shacks here and you can move here around undisturbed. There are quite a few resorts near Varca. There is also a seventeenth century church, Our ladies of Glory church in Varca which you can visit. 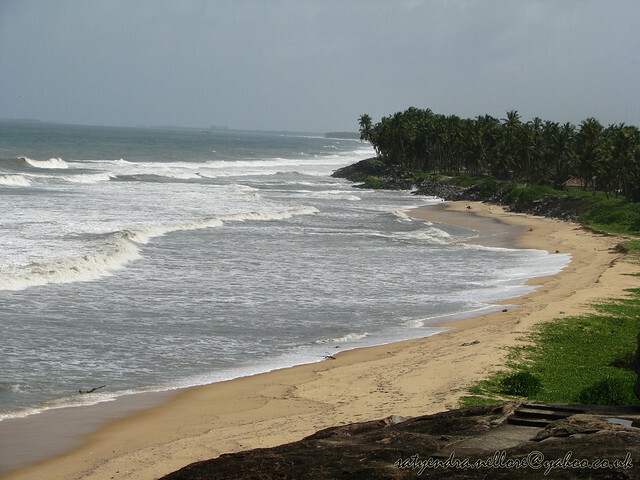 One of the most beautiful stretches, Sinquerim Beach is fast gaining popularity. It is fairly safe for swimming and not very crowded. What makes Sinquerim so special is its golden sands and sapphire waters. 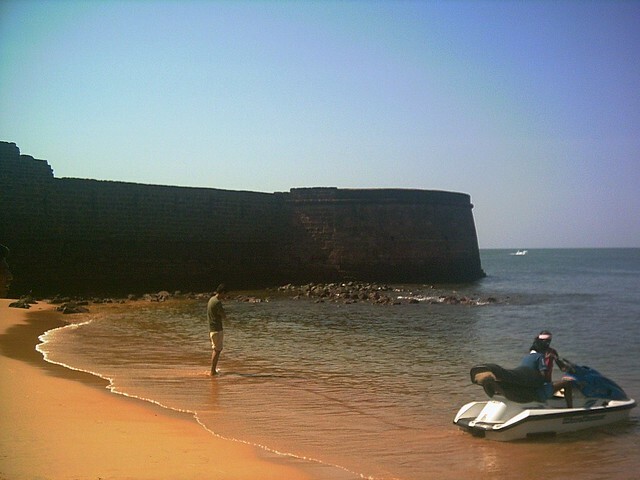 Also on the beach is Fort Aguada, a must visit historical monument of Goa. 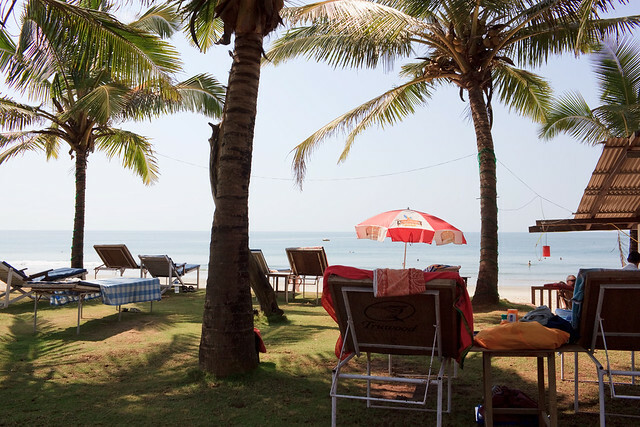 The beach front of Goa's one of the largest and beautiful village Cansaulim is Arossim. This beach in Goa is reasonably safe for swimming. The beach front is very beautiful and not very crowded. Once on the beach you can visit the sixteenth century Church of Sao Tome (St.Thomas the Apostle). Karmatang beach is located 240 km away from Port Blair and is very much known for its turtle population. The place is being developed as a tourist destination offering activities such as swimming, boating and snorkeling to the visitors. Many zoologists who love to specialize in marine life pay regular visits to this place. Also a steamer ride through the mangrove brooks from May abunder should not be missed. The beach promises loads of privacy for the tourists. Corbyn Cove is a beach which is situated 10 Km from South East of Port Blair and is the nearest to the capital. The coconut palms and coral reefs add to the beauty of this gorgeous beach. It is a holiday destination marked by all that it takes for nature lovers to pay a visit. The most ideal period to go to this place should be between October and May. As a beach which offers a wide range of flora and fauna, the beach at Radha Nagar – located at a distance of 7 km from Dolphin Yatri Nivas, it is rated as the one of the best in Asia. It is also revered as one of the top ten beaches in the world. Activities like kayaking, snorkeling and scuba diving are very prevalent here. 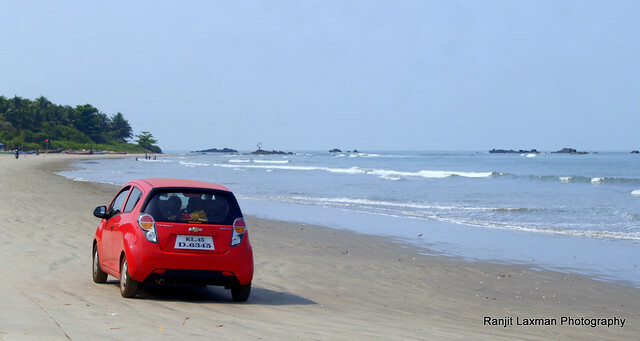 Even elephant drives and sunset views can also be enjoyed at this beach. On Elephant beach in Havelock Island, people can watch training of elephants and elephants swimming in sea. 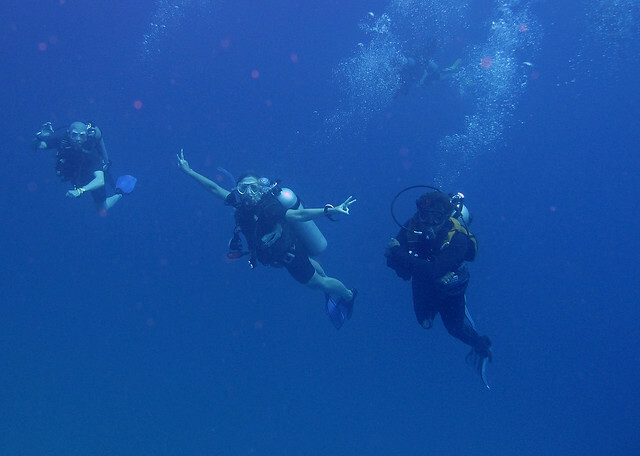 People can also explore other adventures activities like scuba diving, snorkeling and sight seeing. Elephant Beach is one of those unique beaches on Havelock Island which is untouched by tourism, and you can go snorkeling and see everything from eels to sea horses . Long Island is 82 kms. from Port Blair. Long Island offers an excellent sandy beach at Lalaji Bay with unpolluted environment and evergreen forests. The sea around the island is frequented by dolphin convoys. Lalaji bay Beach is 6 kms. away from the boat jetty at Long Island. Long Island is approximately 10km from North to South, 5km from East to West, much of it forested. 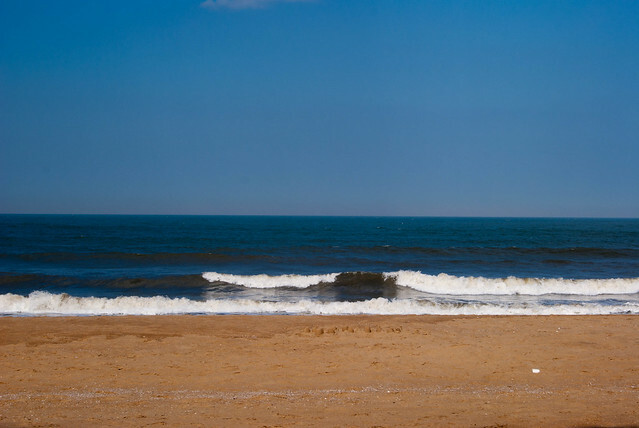 Marina Beach beach is located East of Chennai (Madras) at Kamarajar Road, 3 Km away from the city centre. 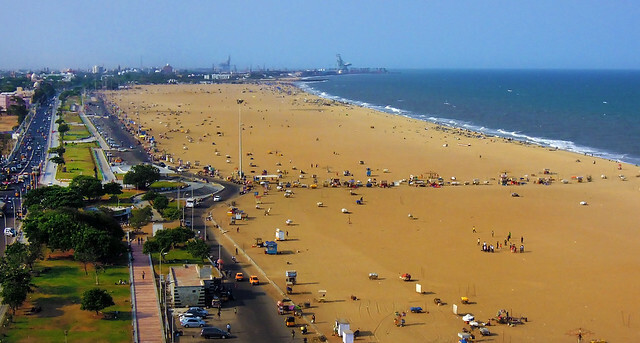 The Marina beach in Chennai is regarded as the second largest in the world in terms of area. It is the most crowded place in the city attracting over 10,000 visitors every day, being the only relief provider for the people of Chennai – who suffer from the scorching heat during summer seasons. The activities like swimming and bathing are not advisable here due to the presence of the strong undercurrent in the waters of the Bay of Bengal. There are so many memorials of great leaders built on his beach. Mamallapuram beach is located 58-km from south of Chennai.The Mahabalipuram beach is famous for the sea shore temple built by the Pallava Kings. Withstanding ravages of time and catastrophes, the temple has been here unscathed for more than a thousand years. The roar of the waves and the tranquil atmosphere here, plus the age old sculptures drive people from across the world to come and enjoy the scenic beauty of this place. Just unwind on this scintillating beach by taking a refreshing dip in the shallow waters or by taking a quiet sun bathe. After you rejuvenated, take a calm walk along the beach exploring the many breathtaking monuments like the 7th century Shore temple that line up on the beach. Other places that attract tourist through out the year are a crocodile bank, snake venom extracting center and an art and sculpture school.This is one tourist spot which no one misses when they travel to Tamil Nadu. Rameshwaram Beach is more of a pilgrimage center which is believed to be the place where Lord Rama had worshiped Lord Shiva in the form of a Linga. Being a serene beach with shallow waters, people turn in huge numbers for swimming and sunbathing. A variety of rare species of marine life such as life-algae, starfish, sea cucumber and sea cow are found here. Famous for the temple of Ramanatha swamy, this place has the bridge which is the longest ever constructed on sea. Kanyakumari beach is located Tirunelveli district 'If one talks of Kanyakumari Beach, it is difficult to overlook the pleasantries offered by sunset and sunrise to our eyes. This probably is the most beautiful beach of all that are there in South India if not in the whole country. With sand of different shades and hues that is present here, first glimpse of this beach itself is more than enough to capture all your imaginations. The mesmerizing sunrises and the romantic sunsets keep tourists coming back here again and again. From the beach you will see the exquisite Vivekananda Rock Memorial that in itself is a huge crowd puller.Most of the people make their visit here precisely for this very reason. Surrounded by seas on the three sides, this place is located on the southernmost tip of Indian peninsula. No different from Rameshwaram, this is also a much visited pilgrimage spot. Due to the confluence of three waters – Bay of Bengal, Arabian Sea and Indian Ocean, the sea waters here will mostly be rough. 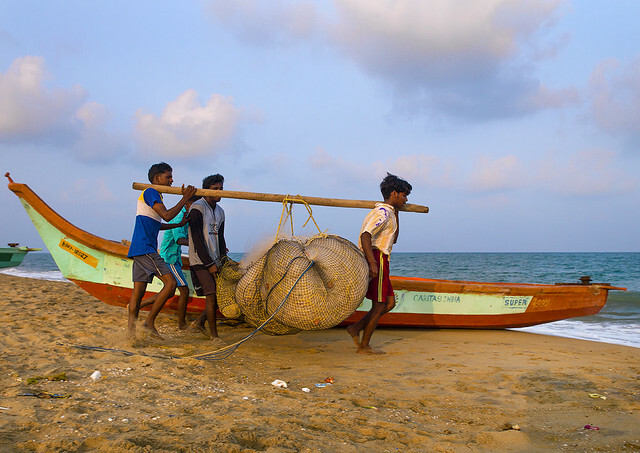 Covelong beach is located 40 km away from Chennai and does not attract larger crowds. This is one of the most important and picturesque beaches of Tamil Nadu. This resplendent beach once served as an important port to the Carnatic nawabs. The sea here is quite calm and as far as aqua-sports are concerned you are in for a treat. Once on this sandy beach, visit the many historical churches and forts that line up on the beach. Do not miss out on the many water sports like snorkeling and surfing that you can indulge in here.Marked by serene beauty, it has been a hub for French in India at one point of time. This has been an ideal spot for the people who wish to meditate due to the peaceful ambiance prevailing here. Adventure lovers never leave the place disappointed either, due to the water sports which are widely played here. The very fact that fishing activities are unsurpassed here, this part of the world is also known as a fishing town. 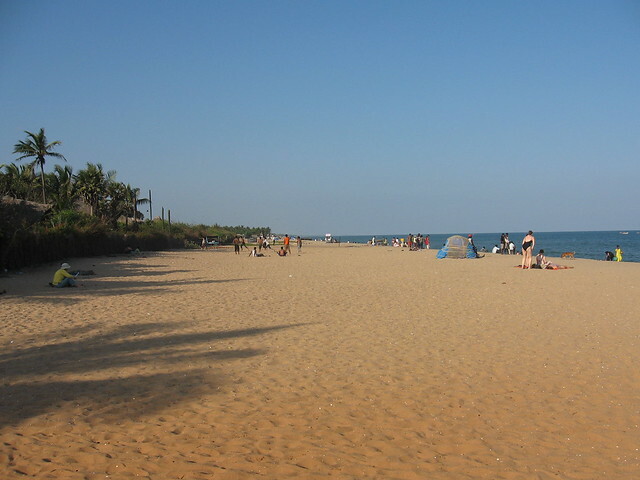 Elliots beach, also known as Besant Nagar beach, is located in Chennai. This beach is named after Edward Elliot, the Governer of the then Madras. It is in close proximity to both Besant Nagar Church and Ashta Lakshmi temple and so it brings in people from both regions. On this beach, a memorial has been erected, honoring a sailor called Karl Schmidt who lost his life in the process of saving a drowning swimmer. From the main Pondicherry town, Auroville beach is around 12 km away. This beach gets more crowds during weekends only and on normal weekdays you will not be able to find many people visiting here. 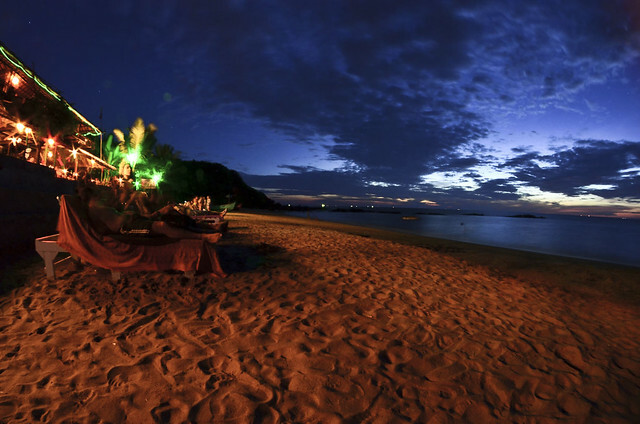 This place is acclaimed for sunset viewing which can leave you spell bound for long times. The four meter long statue of Mahatma Gandhi and a war memorial in remembrance of those who lost their lives in World War I are some monuments on this beach. Out of so many tourist spots in Pondicherry, Paradise beach is one of the most visited places. Situated 8 km from the town of Pondicherry, the riveting appearance of this beach lures the people from all walks of life to put a stamp of their footsteps here. The fact that it is much cleaner than the other beaches over here makes it the most preferred place to visit. The presence of dolphins is one of the highlights of this beach. The 1.5 km long promenade running along the beach is the pride of puducherry. There one can relax or take a stroll at any time of the day. On the sea front are several land marks. The War memorial cold and dispassionate throbbing the memory of last dreams, the statue of Joan of Arc blazing an inspiration, the heritage town hall, the statue of Mahatma Gandhi standing tall, Dupleix statue, old light house, the remains of the old pier, the old customs house, speak the splendor of the by gone era. The well furnished tourist information centre is situated in esthetically heritage building facing the sea to cater to the need of visiting tourists. Karwar is situated just 100 km from Goa is a perfect holiday with gentle waves, palm-laced beaches, silver sand, and calm, peaceful alleys Famous Karnataka Beach.A voyage through Goa makes a good starting point of discovering the thrills of the sea, sand and sun Famous Karnataka Beach.Consisting of five adjacent beaches, the one at Karwar lies as a small island near Goa. 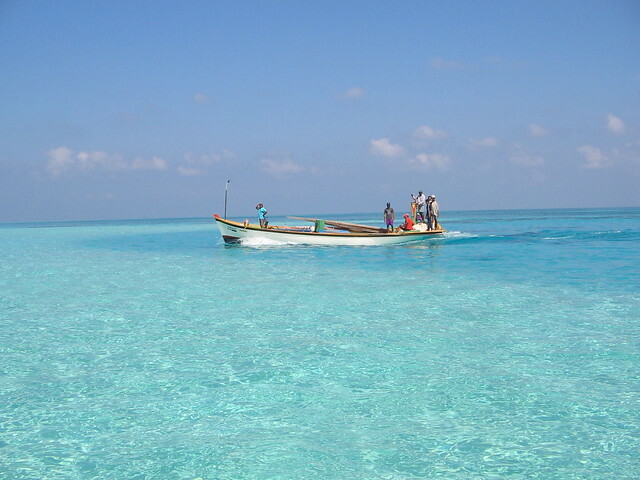 Fishing, kayaking, snorkeling and dolphin hunting are the water sports which are played here. Not only is it the most popular among locales, tourists too find the splendid town of Karwar extremely appealing. Karwar coast has beaches that are fringed with high mountains and valleys on one side and stretches of golden sand and tranquil sea on the other. It is said that the beauty of this place inspired the great Rabindranath Tagore to write down his first play. Apart from enjoying a refreshing sunbath on the beaches, walk around to find other attractions like Sadashivgad Fort, Durga Temple inside the fort, hundreds of year old Venkatrama Temple, an octagonal church and Naganatha Temple which make visiting these beaches even more worth. There are five islands off the coast of Karwar. Of which, the most beautiful is the enchanting Devbagh island.The unique thing about this beach is – on one side the tourists enjoy the warmth of the sun and on the other side they are thrilled by the cool breeze unleashed by the Western Ghats. The hospitality at Karwar beach cannot be equaled by what you experience in other places and so are the sea food which are much tastier than most other places. Located 16 km from Bhatkal, Murudeshwar beach another famous beach of Karnataka is believed to have been sanctified by Pranalinga of Mahabaleshwara thrown by RavanaFamous Karnataka Beach.It is a popular picnic spot, having beautiful blue waters of the sea and the majestic mountains. Coupled with tourists, loads of devotees too visit this beach which is located in the just 1 Km from Bhatkal Taluk of Uttara Kannada district due to the presence of a temple dedicated to Lord Shiva. It is one of the frequently thronged places of Karnataka. This temple upon the hill called Kandura giri is surrounded by sea on three sides. The waters of this beach are ideally suited for activities such as swimming though strong currents are expected to frequent the shores during high tides.Murudeshwar Beach proves to be a splendid place for pilgrims as well as for tourists. Murudeshwar is among the most visited beaches in Karnataka. There is a temple build in Murudeshwar, at a place where the part of Pranalinga thrown by King Ravana fell. The temple is brimming with exquisite statues and carvings. The temple is visited by numerous pilgrims throughout the year. Situated between unending seas, and ever so high mountains, Murudeshwar is a splendid place to spend time alone or for a picnic with your family.Other attractions around this beach are the Murdeshwar temple, the Kanduka Giri and the fort of Tipu Sultan. This lovely destination can be visited throughout the year. 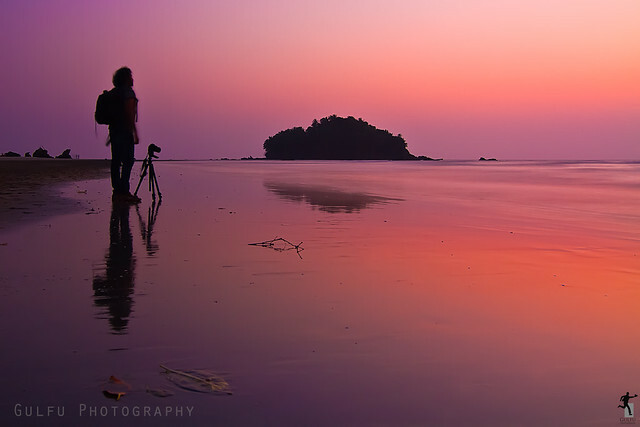 Kurumgad beach is located in the region of Uttara Karnataka and is just 4 km away from Karwar. It is the sort of the beach where nature lovers would like to pay visit more often. The existence of the very popular Lord Narasimha temple is an added charm for the place. Shaped like a tortoise, the esthetic look of the beach can hardly be matched elsewhere. Animals like the dolphins and otters are very much prevalent here. The beach is famous for the hilltop Narasimha Temple where thousands of devotees throng the temple during the annual jatra held on Pushya Purnima every year in early January. 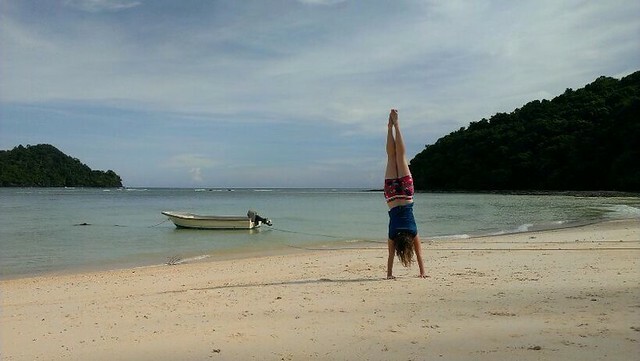 One can enjoy viewing the sea and the sand.The beach also facilitates number of beach activities, one can indulge in water sports such as trekking, fishing.Dolphin and seal-spotting, a boat cruise to other nearby islands, diving, snorkeling, treasure hunts, guided tours, or star-gazing. 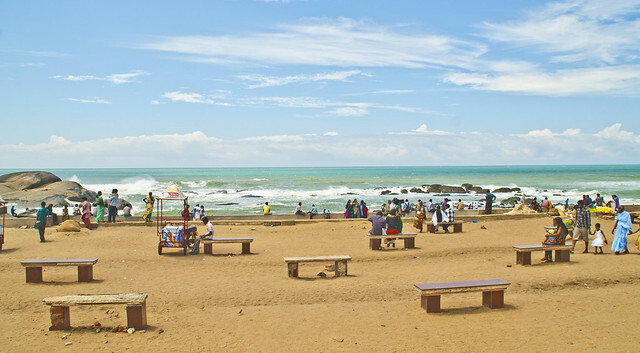 About 6 km from Udupi is Malpe, Malpe is a perfect hangout zone with its virgin beach Major Beaches of Karnataka India. 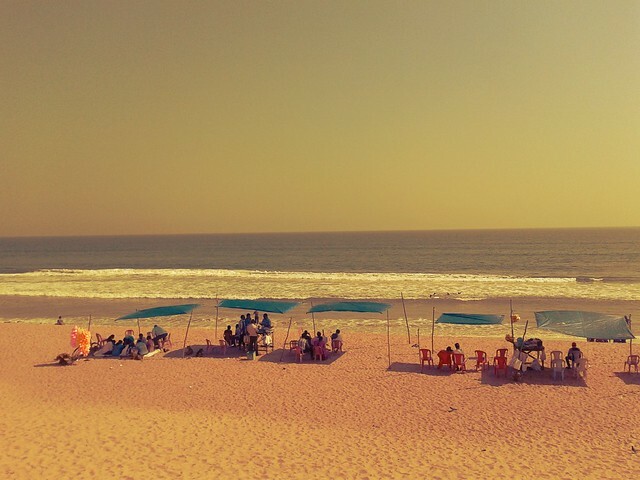 Malpe beach is the most gracious beaches of all. No other beach offers so much calm and tranquility mixed with such stupendous beauty. Lying under the shadow of swaying palm trees, listening to the winds ruffling its leaves, rejuvenates the soul to the deepest. When on Malpe beach, do not forget to explore the island of Darya Bahadurgadh. On the island, visit Balarama Temple and Malpe's oldest tile factory. Another island, to where you can plan a trip to, is St. Mary's Island. The island is 300 m long and 100 m wide and its uniqueness is in the basalt rock formations that rise abruptly from the sea bed in various shapes.The infinite tract of golden sand, pleasantly swaying palm trees, the clear blue sky and the ripple of the sea all set an ideal disposition for an unforgettable holiday here Major Beaches of Karnataka India. An idyllic resort for boating, fishing and bathing the town lies around 386 km from Bangalore. Between October - January is the best time to visit this place.A boat cruise can be taken from Malpe to reach the beach resort, it is yet another beach destination that holds the charm of awe-inspiring views of the sunset Major Beaches of Karnataka India. Gokarna Beach is generally visited by people who go on a pilgrimage since it is very closely located to the Hindu temples in this area. It is not, otherwise, a very popular tourist spot, but is slowly gaining the status. 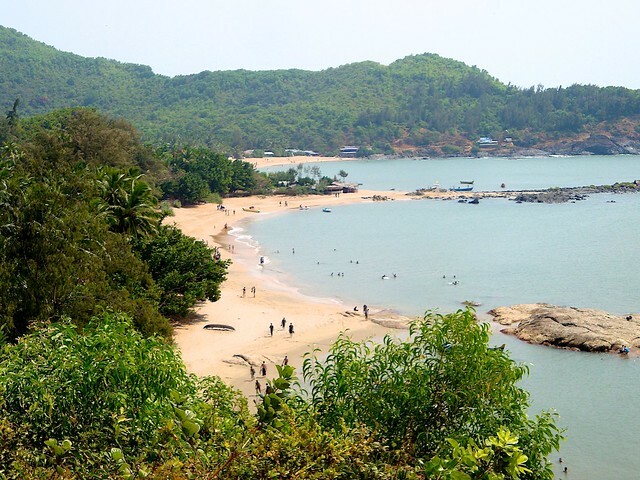 However, closer to Gokarna are four more beaches which draw tourists and they are Kudlee Beach, Om Beach, Half moon Beach and Paradise Beach.Gokarna, a beach town has some most splendid beaches of the region. Om beach, one of Gokarna's five famed beaches, is in the shape of a 'Om,'- most spiritual symbol of Hindus. 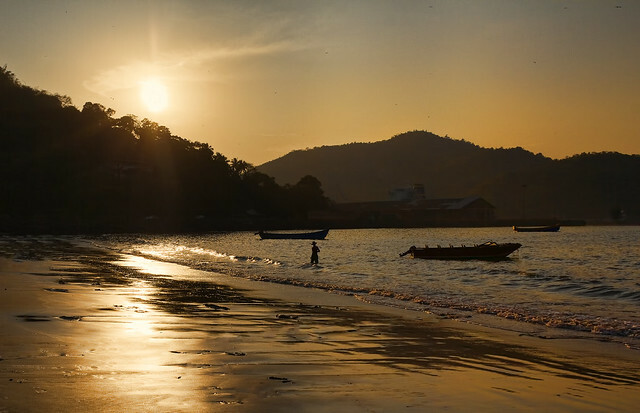 The other famous beaches, compressed between massive steep rock that project like delicate fingers into the sea, are Gokarna, Kudle, Half Moon and Paradise. One can visit Gokarna any time round the year. 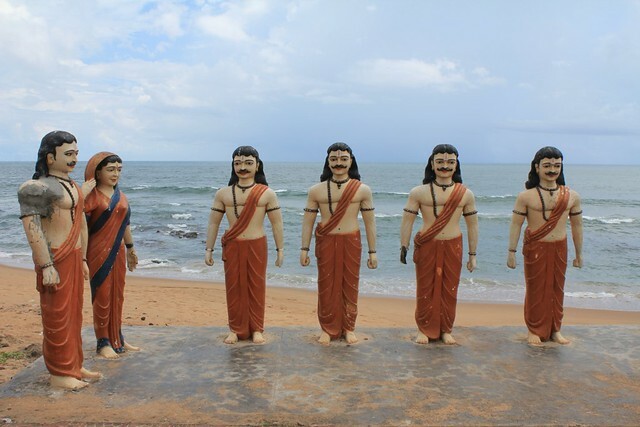 Kaup is situated at a distance of 12 km from Udupi, on the coastal belt. Kaup has a lovely beach that offers a perfect holiday destination with calm sea and beautiful location. 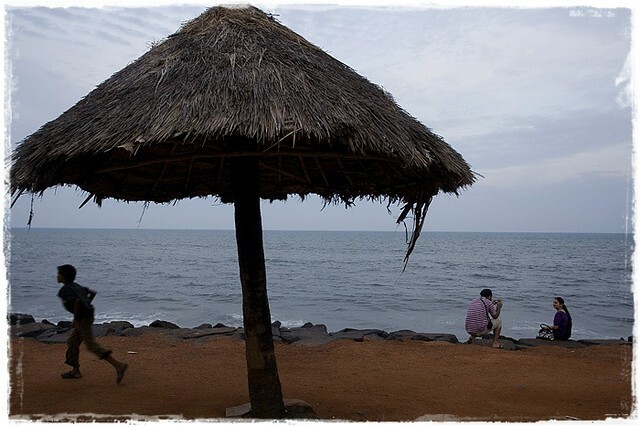 As you go anywhere near Kaup Beach, a very cool breeze and a pleasant environment will give you a very warm reception. This beach houses a very old lighthouse, standing tall at 100 feet high – built in the year 1901. It is also open to the visitors during certain periods in day time. So many movies have also been shot here, further accentuating the fact that it is one of the most pristine beaches you would ever see. Kaup has attractions of a ruined fort and an old 100ft high lighthouse. Maravanthe beach is 50 km from Udupi. The endless stretch of golden sand, swaying palm trees, clear blue sky and the flow of the sea attracts a large number of tourists to this spot.At sunset, the red sky and golden rays convert the entire environs into a fairyland of scenic beauty. 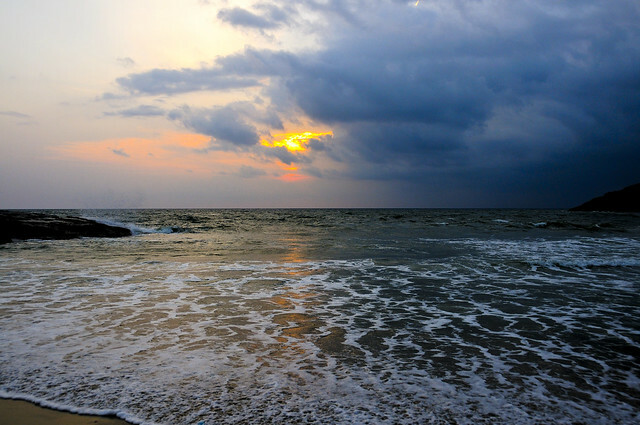 Beaches of Marawanthe are among the best that are there in Karnataka. 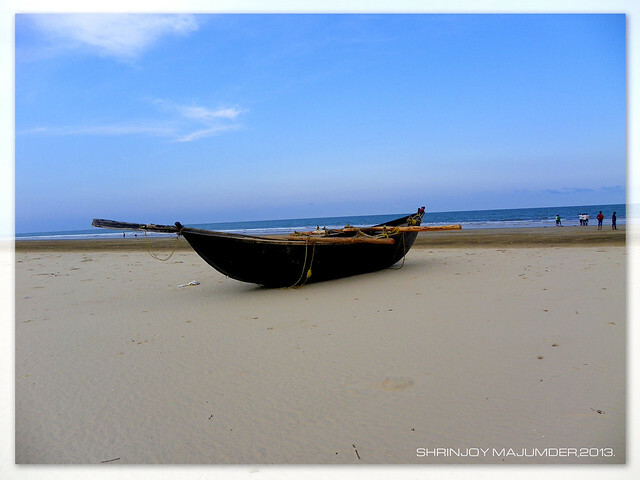 Marawanthe Beach is sandwiched between sea at one side and highway and Sauparnika River on the other side. One thing is for sure that there is no place better than Marawanthe Beach to enjoy a sunset. Most of the beach remains un-congested throughout the day. Just few fishermen carrying on with their daily chores and kids playing with the sand. Though some parts of the beach offer options for water-sports as well. Taking a walk in the late evening, under the streetlights, over the cool sands, is a feeling that is set to stay with you for the rest of your life.Since the national highway (NH17) passes close to the shoreline within the distance of 100m, you will be able to see Arabian Sea on one side and the Kodachari Hills, forming a backdrop of the Sauparnika River on the other side, while traveling. Activities such as scuba diving and snorkeling pull in more adventure lovers to stamp their footsteps here. A drive further up are the Belekal Theertha falls, near Baindur.The Maravanthe Beach has an ideal location for taking up water sports activities. Seawater is safe for swimming with gentle tides beckoning.The pristine splendor and serene enfolding of its virgin beach make it a most desired hang out spot. If you are on a look out for a place to relax and shy away from the daily routines, there is no better beach in Karnataka which could offer such magnanimity than Surathkal Beach. Quite known for its fascinating surroundings, this beach also is famous for the lighthouse which stands amidst the rocks. It is a must visit place for the tourists and is well connected from other important cities of Karnataka. It is also known for sunset viewing. 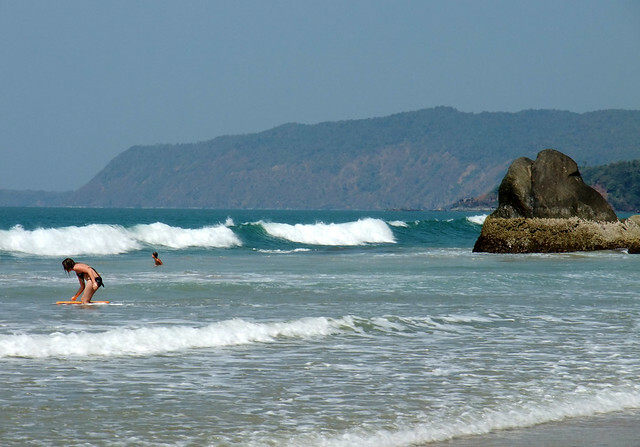 Om beach is located 8 km from Gokarna. It derives its name from the two semicircular coves which join to form an inverted symbol of Om. It is the place where you can see many numbers of Hippo Sadhus doing their penance. It is also a major center for water sports activities such as surfing, water skiing, para sailing etc. 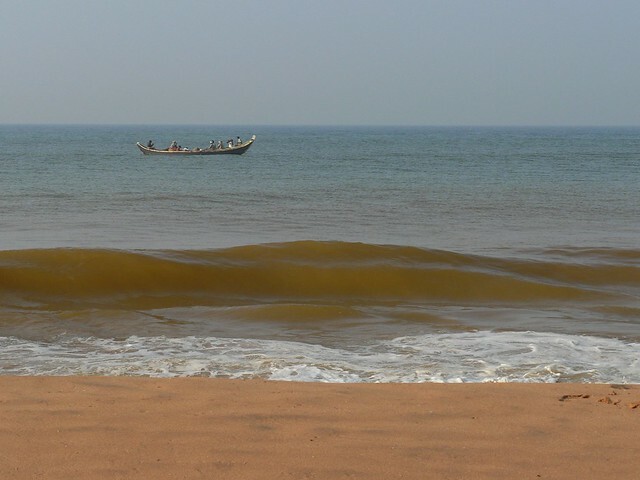 Better known as Bheemili, the beach at Bheemunipatnam has also served as a minor port in the past. It is located at the mouth of Gosthani river and serves as a major attraction to tourists. Bheemunipatnam Beach is a historical beach with ruins of a fort and a cemetery still there, which was once a Dutch settlement. The beach with the backdrop of the fort, is a great place for a one day excursions and family picnics. You will find good number of people indulging in swimming as the water here is considered quite safe for the activity. Situated at the mouth of River Gosthani, the beach is just 24 km from Vishakhapatnam and is easily accessible by all mode of transportations.The Blue Sea, duly complimented by the tall coconut trees in the surroundings, makes the beach visit look more pleasing and appealing. Excellent opportunities of water sports are also available here for the tourists. 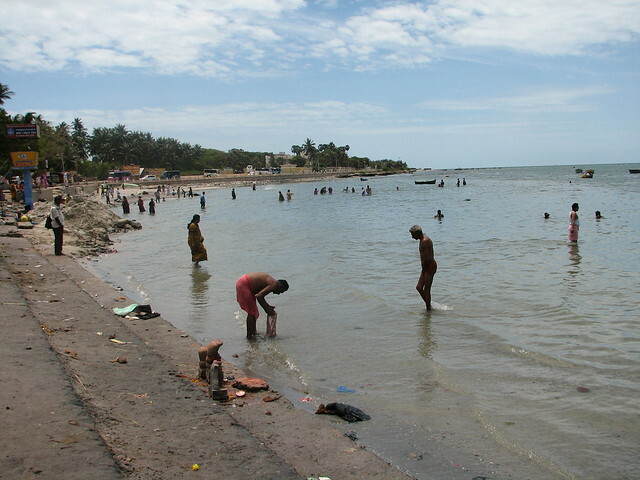 Different from other beaches, the beach of Manginapudi is made of black soil. Situated in the state of Andhra Pradesh, this fishing village is just 11 Kms away from Machilipatinam. Manginapudi Beach was once an important trading center and a gateway to India. The beach is one of the most scenic and historically important beach in Andhra Pradesh. The main attraction of the beach is a nicely maintained park and well kept surroundings. 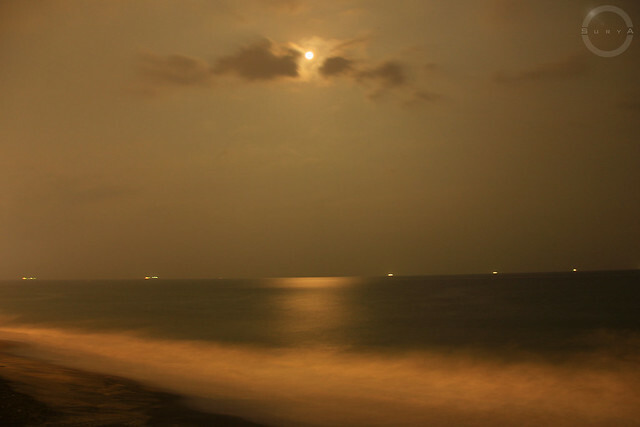 At night, the entire beach is illuminated making it a great time for a soothing stroll. Manginapudi Beach has a natural bay and shallow waters that still make it an important commercial center. The shallow and calm waters are quite inviting for a nice swimming session. The beach is situated around 11 km from Machilipatnam in Krishna District. The nearest railway station is in Machilipatnam from where you can take a bus or hire a taxi.It is a must visit spot which used to flourish as a commercial center long back and has a long history associated with it. The airport of Vijayawada is just 85 Km away from this beach. The existence of shallow waters in the beach makes it a safer one for swimming. Just 8 km from Vishakapatnam is the beach called Rishikonda which is one of the attractions of Andhra Pradesh.Rishikonda Beach is one of those places which are irresistibly beautiful, still hidden from the cluster of tourists. There is not much you can do on this beach, probably that is the main attraction of the beach. The pristine beach is located around 8 km from the city of Vishakhapatnam and is a great place to indulge in swimming as the water are generally quite subdued and predictable. At the moment there is no facility to indulge in beach sports but there are few organizations that are planning to provide the facility on the beach. The calmness of the beach provides a perfect atmosphere to just trod along the coastline on the golden sands. Evenings are the best time of the day to visit the beach for a refreshing outing. 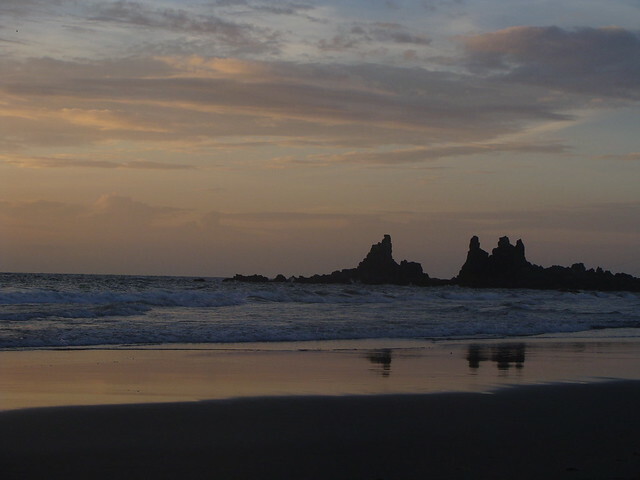 Stunning sunsets and intoxicating scenic beauty are the highlights of this beach. Being an unspoiled beach, which it is, is an ideally suited place for swimmers and water skiers. Covered with golden sands, a visit to this beach would bring in an enthralling and breathtaking experience. 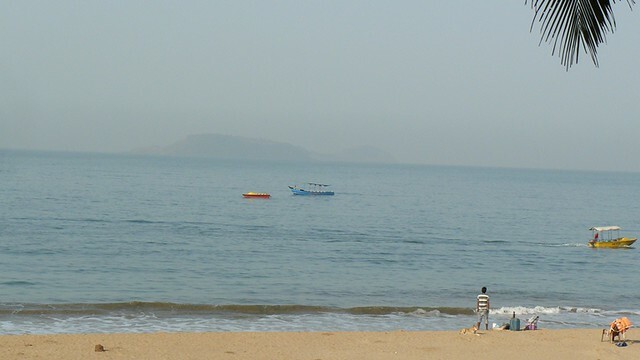 It is reckoned as one of the best beaches in Vizag. Nestling in the important city of Vishakhapatnam, Ramakrishna Beach is not only the most attractive beach, it is also the most famous of all in Andhra Pradesh. There is a lot of activities that you can indulge in here. You can take part in many beach sports, however, do not miss out to visit the fascinating Submarine museum which is the first of its kind in Asia and fourth in the world. It is really a great experience to see the torpedo rooms, the submarine control room radar rooms which a common man was never able to see before the museum came up. You can also ask a fisherman to arrange for a deep water angling tour. The fisherman might charge you a little higher, but after you experience it, you will feel, every penny well spent. It is the most important beach in Vishakhapatnam so you will find no difficulty at all to reach the beach as it is located just 5 Km from city center and is well connected from all parts of the city. The Mypad Beach is one of the most significant beaches in Andhra Pradesh. This is also known as the Mypadu Beach. This is the Telegu name of this beach. The Mypad Beach lies on the coast of Bay of Bengal and entices the visitor with its sizzling sight and is the most exquisite sightseeing in Andhra Pradesh. The Vodarevu Beach is located at a distance just 6 kilometers from Chirala and offers a spectacular sightseeing for the tourists. The Vodarevu Beach is lined by the verdant coconut trees on one side and merges with the seething sea on another. The marvelous experience at the Vodarevu Beach is recorded in the diaries and memoirs of the travelers and they reverberates the unspeakable grandeur of the Vodarevu Beach. 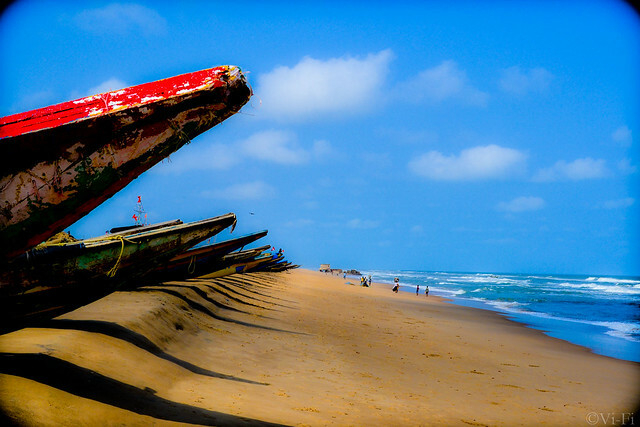 Puri Beach, located on the Bay of Bengal, is a beach in the city of Puri in the state of Orissa, India. It is known for being a hotspot for tourists and attracts a lot of holidaymakers and beach goers to this beautiful place.Puri as city itself, is an important destination with one of the most important Hindu Pilgrimage spots Jagannatha Temple in its vicinity. The magnificent Puri beach only adds to the attraction of the city. 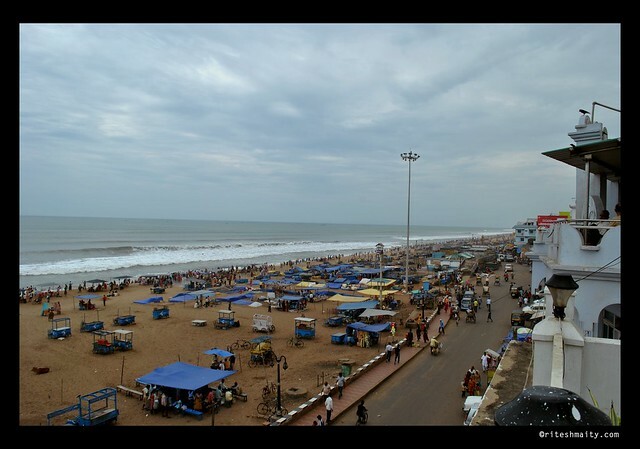 Puri is seen by many as the finest of all the beaches on east coast of India. And once you visit the beach, you will have no doubts as to why this beach is considered the best. 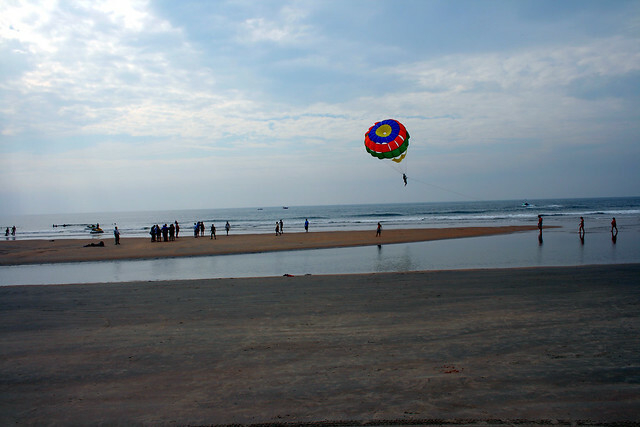 Puri Beach is the most favored vacation destination in Orissa. Puri Beach Festival is one thing that attracts people from all parts of not only Orissa but from whole of India. The festival is an amalgamation of modern as well as classical forms of entertainment. 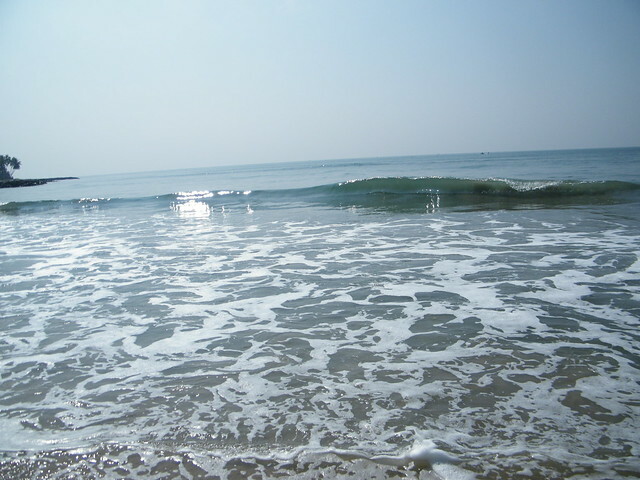 Gopalpur is a beach where you will be most active. The picturesque surroundings and calm blue waters are a temptation to one and all. Go out into the tranquil sea for a soothing swimming experience that will take out all your worries and stresses. When you are through with water sports, just relax and lie on your back for a sunbath. Look at the local fishermen going through their daily chores. Nearby, there are few shops from where you can shop for beautiful sea shells and other locally made items. 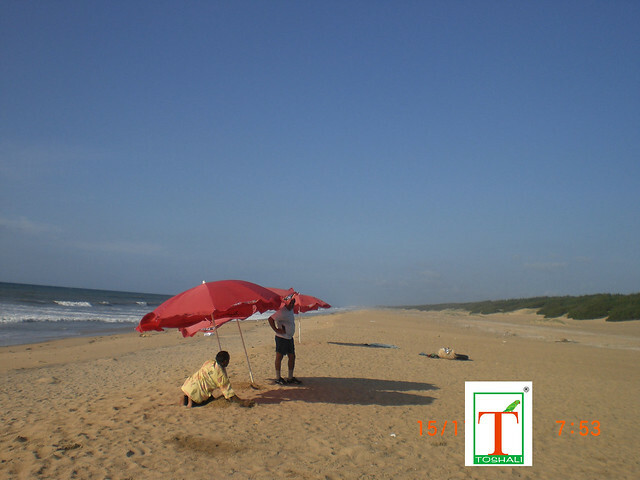 Situated close to the famous Sun Temple, Chandrabhaga Beach has also become a great tourist attraction in Orissa. Covered with shimmering sands and dotted with casurina trees, the beach is considered among the best in eastern India. The main enticement of the beach is its solitude. 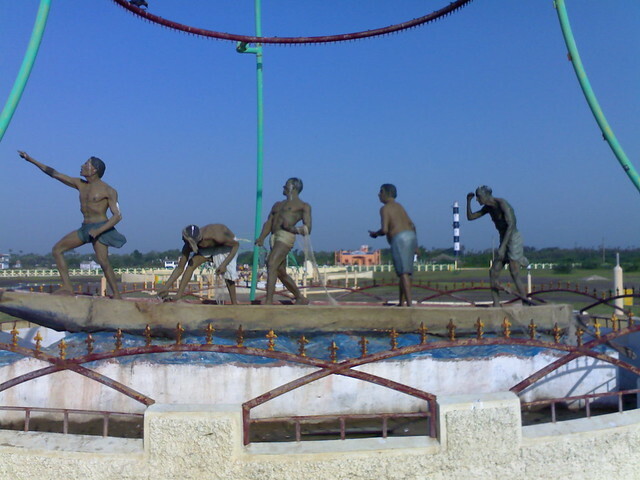 Although the scene is totally different when it hosts the annual Chandrabhaga fair. People from all parts of Orissa come to Konark for the fair. View of sun setting on the horizon has more of calming effect than mesmerizing. When you are visiting the magical Sun Temple, do not forget to visit the Chandrabhaga Beach as well. Paradeep is more famously known as the port city of Orissa. One of the most important and oldest ports in India is situated in Paradeep. The vast beach is invitingly calm and serene. The blue water playing with the golden sands of the beach is a sight worth a watch. As the evening sets in locales come out to the beach for some fresh air. The beach is famous for temple 'Tulasi Kshetra'. The temple is dedicated to Lord Baladeva. 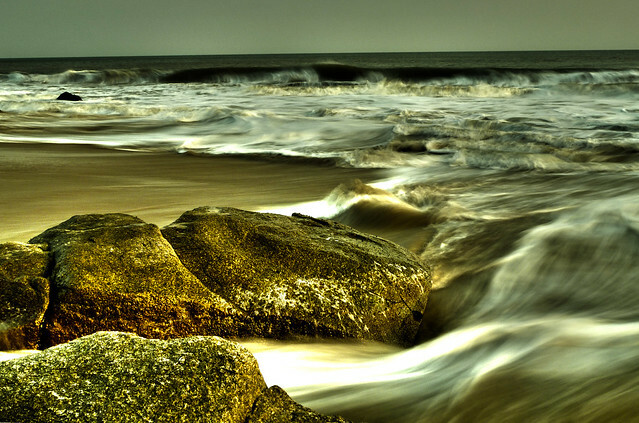 The beach is situated at a distance of 94 km from Cuttack and 125 km from Bhubaneswar. One can visit the beach at any time of the year, however the best time to visit the beach is around October. This beach is just 60 km away from the city of Mumbai AND 10 km away from the capital of Konkan, Nalasopora Village, which is believed to be the birthplace of Gautama Buddha in one of his previous lives.Renowned for its breathtaking night time appearance, Bassein Beach is situated on the west coast of Maharashtra . Since it is nearer to the city, people find it easily accessible and so group here in large numbers in the evenings. It is a hot picnic spot with loads of religious and cultural importance attached to it. It is a beloved location for the tourists who want to refresh their mind and body amidst the tons of mundane activities.Baseein beach has been famous as a shipbuilding site for centuries. It is also famous for its wide sandy beach, its forts and exceptionally ravishing churches. Its wide beaches are symmetrically covered with palm grooves and fort ruins which gives it a very calm look. Madh Island Beach lies in the northeastern coast of Mumbai and is easily accessible both by local trains and city transport buses. This beach is not considered very safe for swimming as the water current keeps on changing which makes the sea a lot unpredictable.Madh Island is a place where many Bollywood movies and soap operas have been shot. 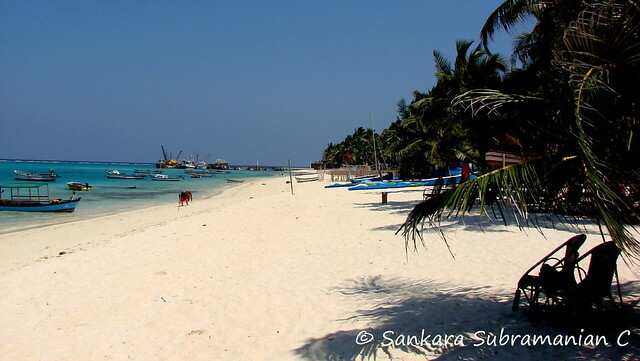 The waters here are crystal clear and this beach is one of the cleanest and most well maintained ones in India. It is where Mumbai’s elite society host lavish parties most of the times. Most of the people visit this beach with their families in order to free themselves from the hustle and bustle of daily life. 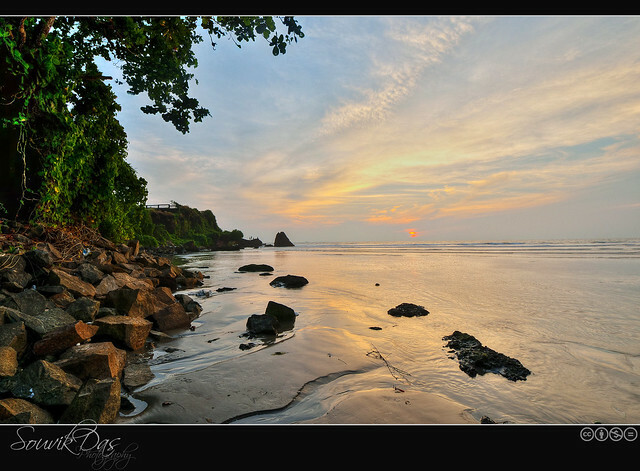 The scenic beauty of this beach is complemented by the Mangroves surrounding it. It is located on the north west coast of Mumbai. Madh Island is generally famous for the lavish beach parties and techno raves held at the many posh bungalows lining the beach. Marine Drive beach is located in the central Mumbai.it isalso known as Netaji Subhash Chandra Bose Road, lies in South Mumbai is famous for its beautiful walk way and the sunset point. The fact that this beach is located right in the center of Mumbai makes it easily accessible through all means of public transportation. The beach forms a natural bay with a six lane concrete road about 3 km in length, stretching north along the coastline. The visitors get enthralled by the picturesque beauty of this place. It is also referred to as the "Queens Necklace" as the beach when illuminated by street lights in the night time, gives us such a fabulous view like a string of pearls adoring a necklace.It is said that Mumbai experience is incomplete without having tasted the famous Paav-Bhaaji at the Chowpaty Beach from one of the food vendors who are lined up on the beach. Chowpaty Beach is more famous as the site where the idols of Lord Ganesha are immersed in the sea which the end of Ganesh Chaturthi festival. Juhu Beach is one of the crowd pulling locations in Mumbai and is situated 18 km from the center of the city. This beach has seen so many film shootings happening from time immemorial. However it is not advisable for anyone to visit this beach during monsoon seasons when high tides are expected. 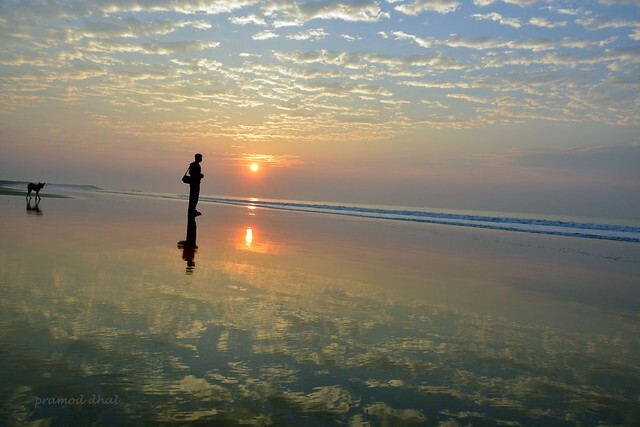 Hailed as the "Queen Beach", Tarkali is really a fabulous water body. Aided by crystal clear water, on a bright sunny day, one can see the sea bed up to the depth of 20 feet. A long and narrow stretch of beach with pristine water adds value to it. Scuba diving and snorkeling satiate the hunger of adventure lovers. The Even house boat facility is made available at Tarkali with hi-tech equipments and luxurious amenities on board. The white sandy beach of Harminder Bay offers quite a spectacle to the nature lovers. The place is located 100 km away from the capital city of Port Blair. If you want to enjoy the beach to the maximum, the best time to visit this place is between November and March. The intrinsic beauty of this beach cannot be easily described in words. It is one of the best places for anyone to plan a holiday. Dahanu Bordi Beach, located in the Thane District, it is a distinctively silent beach. This beach is in Dahanu Town and is a stretch of 17 km. This was once a barren land that prospered under Irani settlers. Dahanu is famous for the lines of fruit orchards and the fruit Chikoo. Udwada, 'The Mecca of Zoroastrians' is also very near to Dahanu. Udwada has a beautiful temple which houses their sacred fire and is said to be kept burning for almost the last thousand years. Dahanu town is around 145 km away from Mumbai and can be reached easily either by train or by road. Marve- Minori- Gorai are three close by beaches which are famous as the ideal places for family outings. All these beaches have hilly backdrops which are sometimes employed for trekking as well by the locales. Out of these three beaches that lie north of the city, Marve is the closest to Mumbai and is a fishing village and is also considered to be the quietest of all, whereas Minori and Gorai are more famous for the night beach parties. The nearest railhead, Malad is a suburban station on the western railways from where good numbers of buses ply to these beaches. Located on the western coast of Maharashtra, Ganapatipule is considered as a pilgrim site but it successfully doubles up as a tourist destination as well. When you are on this beach, you can visit the Velneshwar Beach Temple and Pawas as well, where Swami Swarupanand's Ashram is located. You can also explore the Jaigarh Beach and Jaigarh Fort. Nearest airport is Mumbai and nearest railhead is Ratnagiri around 50 km away. beach of Daman, a Portuguese territory till 1961, is now a Union territory of India. This beach is among the most important ones in Maharashtra and when you are on tour of Beaches of Maharashtra, do not miss this one for anything It holds many fabulous attractions like Moti Daman Fort, Light House, Gandhi Park. It is situated along the Mumbai- Ahmedabad highway, around 170 km from Mumbai and is easily accessible. Silvasa and Vapi are two other beaches which are close by and can be visited for their amazing waterfronts. A weekend getaway for locales of Mumbai and Pune and fast becoming an international tourist spot, Harnai Beach is located at distance of some 200 km from Mumbai. Its an isolated stretch that is lined with a fort on its northern end. You can also visit Murud, the beach south to Harnai which is famous for its clean white sand and soothing water, and Panhale Kazi, the famous rock monument which is around 30 km from these beaches. Wander into the Beaches of Maharashtra that will give you sights straight out of a Picture book. These magical wonderlands will help you forget yourself and give a chance to discover a new you. The Beaches of Maharashtra promise one thing for sure, What you dream is what you will get. So come to these lands and find yourself literally in heaven. The beach at Diu is situated at an altitude of 29 meters, due to which you can experience a pleasant climate here. The Diu Fort, constructed by Bahadur Shah, the ruler of Gujarat, gives a nice view of the sea. The existence of such fantastic forts and palm trees makes this beach as one of the most visited places in Gujarat. The ideal time for visiting this place is between October and May. 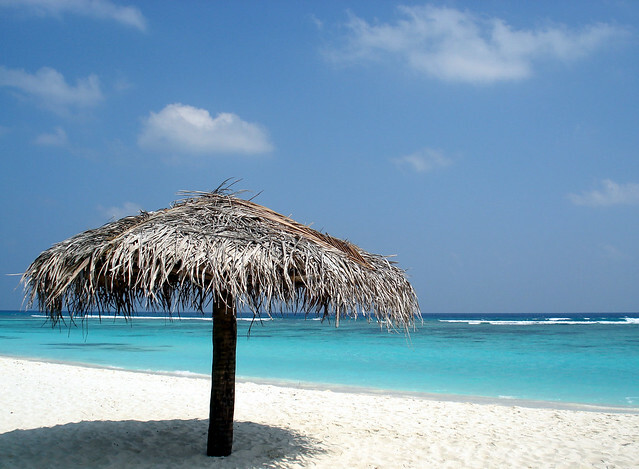 A palm-fringed, largely deserted and secluded beach, Nagoa is undoubtedly one of the most beautiful beaches in India. Just twenty minutes refreshing drive from Diu will bring you to Nagoa Beach which with a stretch of about 2 Km from one end to another is exceptionally beautiful .The unique shoe-shape of the beach makes it more beautiful. A swim in the water of this unspoilt virgin beach is most refreshing one. Located in Gujarat at around 288 kms away from Ahmedabad. Across the bridge from Ahmedpur Mandvi, Diu Island comes as a real, pleasant surprise.It lies just a few minutes offshore from the mainland of Gujarat, yet has retained the feel of an island in the Mediterranean. The beach is white and firm, ideal for walks, and the water perfect for swimming. A variety of Water sports options are on offer-water scooting, skiing, surfing, para sailing, and speedboating. The city of Surat is situated on the bank of river Tapi in the western Indian state of Gujarat. 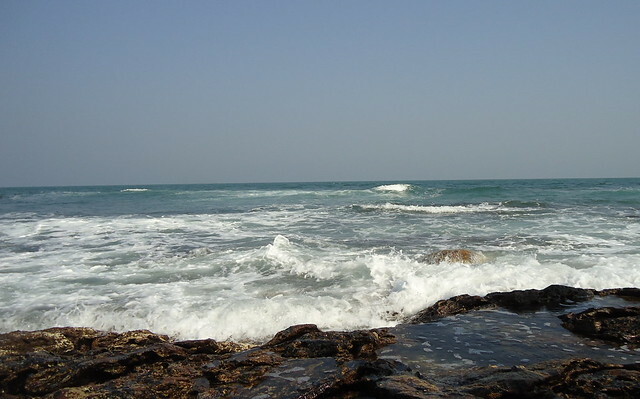 A number of interesting beaches are scattered around the port city of Surat. Dumas (16 kilometers) and Hajira (28 kilometers) are the most popular. The beaches around Surat are 'exclusive'-each one of them a charmed place where it is easy to lose one's heart to seaside sunrises and sunsets of exquisite beauty. Lying on the Beaches of Gujaratsoft sands kissed by the golden sun with the blue sky above and the haunting sound of the sea in one's ears can be a powerfully evocative experience in which one can absorb the trinity of land, sea and sky in a rare, wonderful unison. Porbandar is situated along the Arabian Sea in Gujarat. Famous as the birthplace of Mahatma Gandhi, the city is well connected to the other parts of the country by rail, road, and air. Despite its glorious sunsets, fashionable esplanade and delicious sea food in the restaurants, tourist bungalow and hotels running along the sea front, the Chowpatty beach at Porbandar is primarily for those who are not too fastidious about beaches.